Lei Shen has consolidated his power on the Isle of Thunder, and if he’s not dislodged, his reborn army will threaten all of Pandaria. But the return of the Thunder King is good news for you , because it means that new challenges and triumphs await in our latest major content update. A massive new zone, a new raid, server-wide events surrounding the siege on the Isle of Thunder, new factions, world bosses . . . and more. Brace yourself for the storm. Head over to the Under Development page now for a preview of the major in-development features planned for the next World of Warcraft patch, The Thunder King . Patch notes for 5.2 The Thunder King could be found here. Delve into the Thunder King’s stronghold, one of the largest raid dungeons that Azeroth’s adventurers have ever seen. Get the latest scoop on the raid schedule for Throne of Thunder. Learn more about the epic showdown between Lei Shen, the Zandalari, and those who would stop them. There, on the horizon to the Northwest, do you see it? There’s a sense of foreboding that clings, and something else . . . . Learn more about the situation involving the mogu and their once and perhaps (more frighteningly) future emperor, Lei Shen. Get Bashiok’s thoughts on how to maximize your play time in the weeks before and after Patch 5.2. Check out our sneak peak at at one of the new world bosses, Nalak, The Storm Lord. Check out our sneak peek at one of the new world bosses, Oondasta. Let’s catch up with the legendary quest line so far and take a peek at what’s to come. Learn how Conquest and Honor are going to work after the patch. Take a peek at tier 15 armor sets that can be found inside the Throne of Thunder. Take a look at the Tyrannical armor sets that the most accomplished PvP competitors can earn in Season 13. Learn more about end date for Battleground Season 12 and get information on upcoming Season 13. Get up to speed on PvP changes and hit the ground running when 5.2 goes live. An update on planned improvements for PvP gear, and get a look at the thought processes that motivated those changes. An overview of important changes to Death Knights, Druids, and Hunters. An overview of important changes to Mages, Paladins, and Priests. An overview of important changes to Rogues, Shamans, and Warlocks. An overview of important changes to Warriors and Monks. Do you have an issue? See if we already know about it. This is a list of changes for Patch 5.2. 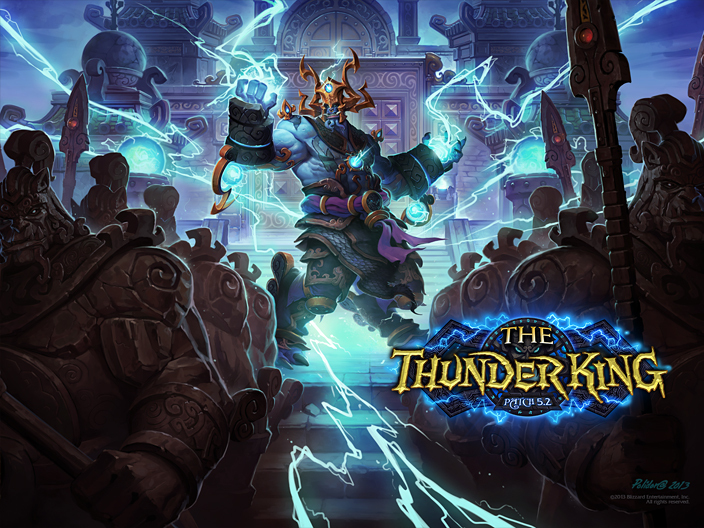 A list of hotfixes addressing various issues related Patch 5.2, The Thunder King.